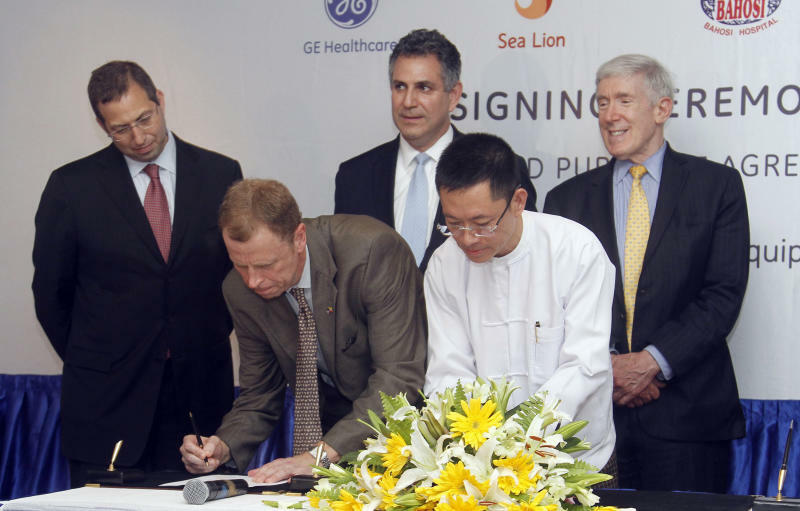 YANGON, Myanmar (AP) — Just days after the U.S. eased key sanctions on Myanmar, General Electric became the first American company to invest in the former pariah state, signing deals Saturday to provide medical equipment to a pair of hospitals in the country's biggest city. Myanmar President Thein Sein held talks on Friday with U.S. Secretary of State Hillary Rodham Clinton, who declared the country open to American investment. 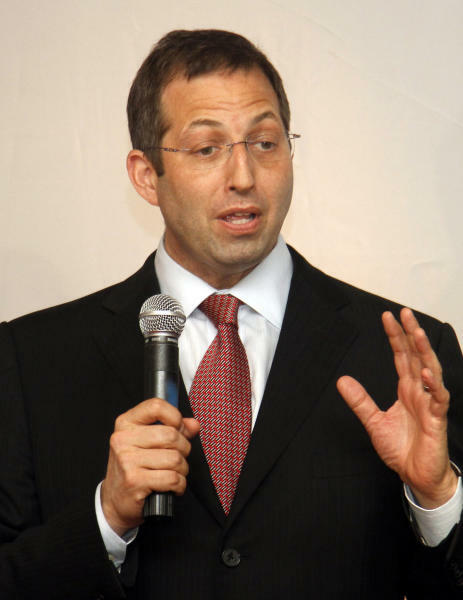 The meeting in Cambodia was attended by some of the largest U.S. corporations. On Wednesday, President Barack Obama's administration officially gave the green light to American companies to invest in the country, also known as Burma. Western nations imposed economic and political sanctions on Myanmar's previous military regime in response to its repressive and undemocratic policies, and the easing of sanctions is a reward for a series of reforms by Thein Sein's new government over the past year. GE's deals were signed in Yangon the presence of Derek Mitchell, who assumed his job Wednesday as the first U.S ambassador to Myanmar in 22 years. The agreements, worth about $2 million, were inked with two private hospitals. Under the deals, GE will provide X-ray machines through Sea Lion, a local company. "The recent granting by the U.S. government of licenses to operate will enable us to fast-track our plans to establish an office here in Yangon and execute our strategies, mainly in the energy and healthcare sectors," said Stuart Dean, who heads GE's Asia operations. "We believe there is no turning back." Mitchell added, "My fervent hope is that we're going to be doing this on a regular basis." After Clinton met Thein Sein in the Cambodian town of Siam Reap on Friday, the two hosted representatives of American businesses including Coca Cola, Ford Motor Co., General Electric, General Motors, Goldman Sachs and Google. Clinton said U.S. officials were taking 70 company representatives to Myanmar this weekend to speak with officials and explore opportunities. Myanmar represents a similar sort of "frontier investing" climate for Americans as Vietnam did in the 1990s after the U.S. lifted its trade embargo. Myanmar is also transitioning to a free-market economic system, as Vietnam did. But its history of isolation means it will be starting from a much smaller base. An idiosyncratic socialist regime barred most foreign investment in 1962-1989, and then Western sanctions against the repressive military regime limited economic growth. A complicated dual exchange rate system, changed only this year, also discouraged repatriation of profits. Virtually every sector in Myanmar is underdeveloped, but several stand out for investors. Tourism is expected to boom, with a shortage of hotel rooms at all levels. The country already has large foreign investments in oil and gas exploration and production, but there remains room for growth. The government has vowed to seek foreign help in expanding the country's power industry, which is in such a sorry state that blackouts and limited service are common and have prompted public protests. Mining is another underexploited sector, with Myanmar's gemstone reserves considered among the world's best. The low-cost economy also makes Myanmar attractive for production of garments and footwear, although it faces regional competition from Bangladesh, China, Cambodia and Vietnam.